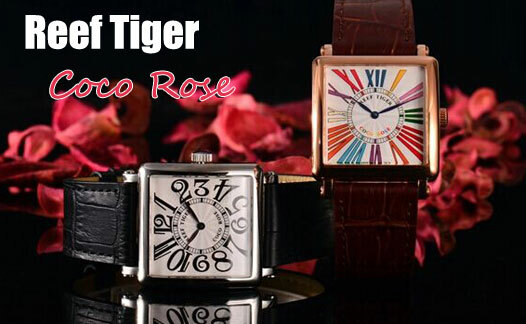 Coco Rose represents the delicacy and fortitude of woman, it has perfect lines and elegant appearance, which shows the classic style of Reef Tiger to modern young women. At the same time, Coco Rose is also the jewelry treasure that is full of Paris mystery. 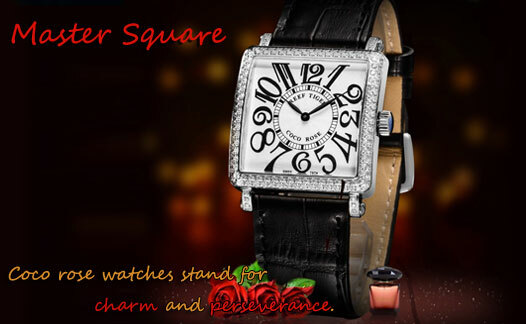 Coco Rose Master Square uses fashionable square case, this design represents the fortitude and personality of modern women, the perfect case arc makes it more elegant and comfortable to wear. Abandoned the complex dial design, Master Square uses hour markers to show fashion attitude, those hour markers, which occupy half of the dial area, use variant and exaggerated font design to display the unique personality of Coco Rose. 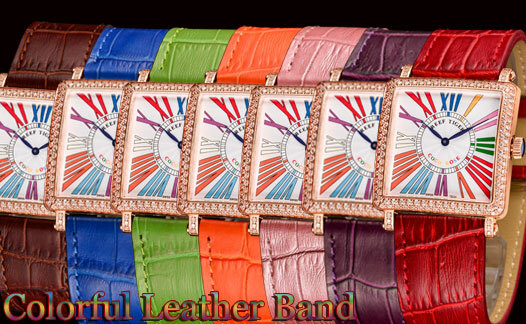 To fit the changeable hour markers, the leather straps of Master Square watch also adopt multi-colored design, Italian calfskin leather band perfectly fits wrist and brings nice wearing feelings. To offer multi-colored band choices, Master Square adopts removable design on band, there is spring bar device on the top of the band, you just need a smooth push to remove the strap. Master Square has several hour markers styles, multi-colored digits, multi-colored Rome numerals, black and white digits, black and white Rome numerals, so many choices that you can always find your favorite. 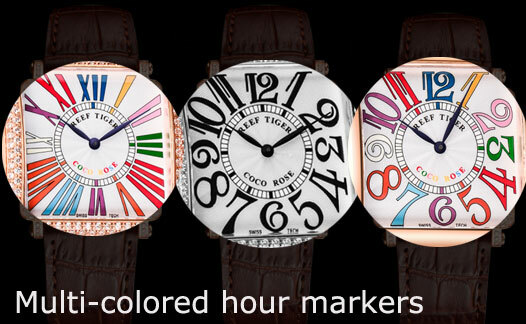 Some watches adopt Swarovski crystals inlaid design, which is dazzling and easily catches your attention. Swarovski crystals cover the whole watch, the case, lugs and even buckle are embeded with crystals, very fashionable and luxury.